Chowbacca! : Five Amazing Facts About Mint That Will Shock and Embarrass You! Five Amazing Facts About Mint That Will Shock and Embarrass You! 1. Smoothies. Yeah, I still carry a mad on for the word smoothie, but, like foodie, we're stuck with it. 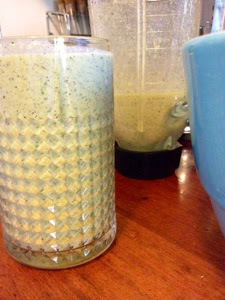 That said, I like to mix up my morning breakfast shake both for nutritional balance and palate pleasing purposes. One regular ingredient, though, is a handful of the four kale varieties in my garden, and that includes their nutritious and bitter stems. One way to balance the bitterness of the kale is with a dollop of raw honey and a squeeze of lemon. Another way is mint. 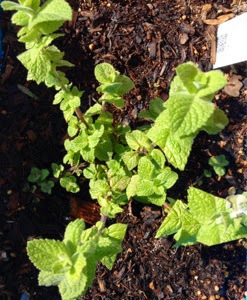 Currently we're growing chocolate and apple mint varieties. I add one, the other, or a combination of the two to my morning breakfast shake and the bitterness is gone. I'll post some smoothie combinations at the bottom of the page if you're interested. When done right they are a tasty way to get your daily servings in. 2. Just eat it! 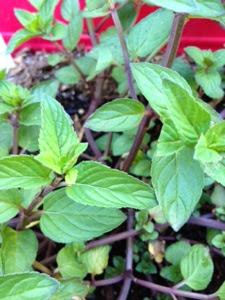 Mint is great all by itself, and it contains trace amounts of vitamins and minerals. 3. Mint and lemon water. You'll enjoy hydrating more with a pitcher of this in your refrigerator. Just thinly slice a lemon and muddle some mint leaves to release the oils. It's great with or without a meal, and the water draws out the best of both the lemon and the mint and puts them into your body in a refreshing way. Also, it's much better for you and the environment than that crap you're buying at the store. 4. Salads! Feta and mint. Cucumber, feta and mint. Cucumber, feta, lime, and mint. Strawberries and mint. Tomato, red onion, and mint. Quinoa, corn, and mint. Watermelon, goat gouda, and mint. Kale, feta, tomato, avocado, and mint. Getting the picture? Jazz up those mixed greens you're growing with a mint-y fresh salad now and then. 5. Cocktails! Mint juleps aren't just for race day. Muddle some mint with your bourbon for a summer evening's respite. Try a mojito. Also, I've rebooted The Rear Admiral cocktail with minty goodness as you'll see tomorrow. There are more than five things to do with mint, like ice cream, for example, but we're going to leave it here for now. Next are those smoothie ideas I promised at the top of the page. Banana, apple, kale, protein powder, flax seed oil with lignans, coconut milk, probiotic Greek yogurt or kefir, carrot greens, fennel, raw honey, mint. Banana, strawberries, kale, protein powder, flax seed oil with lignans, almond milk, probiotic Greek yogurt or kefir, blueberries, pineapple, mango slices, mint leaves. You get the idea. I mix-and-match flavors daily. Just give it a taste when everything is mixed and chopped and add whatever it needs. A spoonful of peanut butter also adds protein, flavor and enough sweetness to overpower the kale's bitterness. 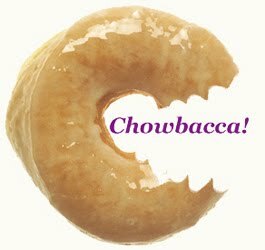 Until next time, Chowbaccans, stay minty.